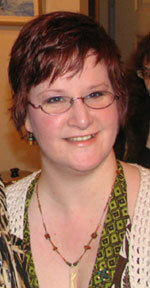 Hello,I am Beth Hansen-Buth, Reiki Master Teacher & Practitioner, and Mystical Fantasy Artist. For many years I had been living the life of a fantasy artist, hauling my artwork around to shows, attending Fantasy Conventions and New Age Expos to share my art. Now a new phase in my life has begun. Guided by my intuition I am dedicating my life to healing myself and others. While my art has always been my gift, healing is my calling. I had been practicing daily meditation for a little over a month, and loved working with energy to bring my hectic life into balance and harmony. While at my favorite Metaphysicalstore Eye of Horus in Minneapolis , I was aware that Reiki services were offered every week. So I thought it was time to learn a little bit more about it, and I asked if anyone could recommend a good book. Reiki Master Maggie Sterba left a copy of Reiki by Carmen Fernandez for me to read. I took it home and read it cover to cover, the energy of Reiki seemed to shine through the words and the beautiful photographs. Filled with peace and joy, I knew that Reiki was for me. You could say I was drawn to Reiki! as a dog with a nasty virus and working twelve hour days selling my artwork at the show. The booth next to mine was for Pranic Healing. I spent the quiet moments listening to them explain this modality to the curious Expo goers, and I got one of the mini-healings they were offering. It seemed to help. So when I got home, I bought a book about it, played with the exercises and then signed up for the class. with formal training in energy work as healing modality. Thirsty for knowledge, I discovered I could re-take this class at a significantly reduced rate, so I signed up. When it came time to get my Reiki II training, I decided to take it from Kristin Barton. Since she was offering a weekend seminar including Reiki I for another student, she suggested that I come both days and I’m so glad I did! This is the next step toward becoming a Reiki Master Teacher. In this class I was attuned to the Master symbol, and received training in Aura Clearing, Psychic Surgery, as well as how to work with a crystal grid. This completed my training to become a Reiki Master Teacher. In this class we discussed the practice of reiki, advanced distance reiki techniques including Reiki Stacks, an attunment to the Reiki Master symbol, and training on how to teach Reiki and pass on the Reiju or attunment blessing. Both Reiki and Pranic Healing modalities are wonderful, and since I’ve got Gemini for both my Sun and Moon, it makes perfect sense to me to have double the fun and expertise to offer as part of my services. of my full color illustrations were printed with the story. Full-color interior illustration – The Priestess. In August of 2011 I founded the Twin Cities Pagan Healers Group and we are having a blast!